The SEGD Airport & Transportation Workshop is a two-day event jointly organized by SEGD and ASMN. 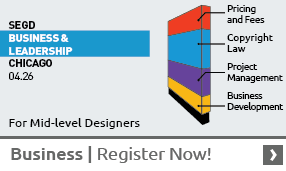 This event focuses on the complexities of airport design programs from signage and wayfinding planning and management to customer experience and integrated technology. 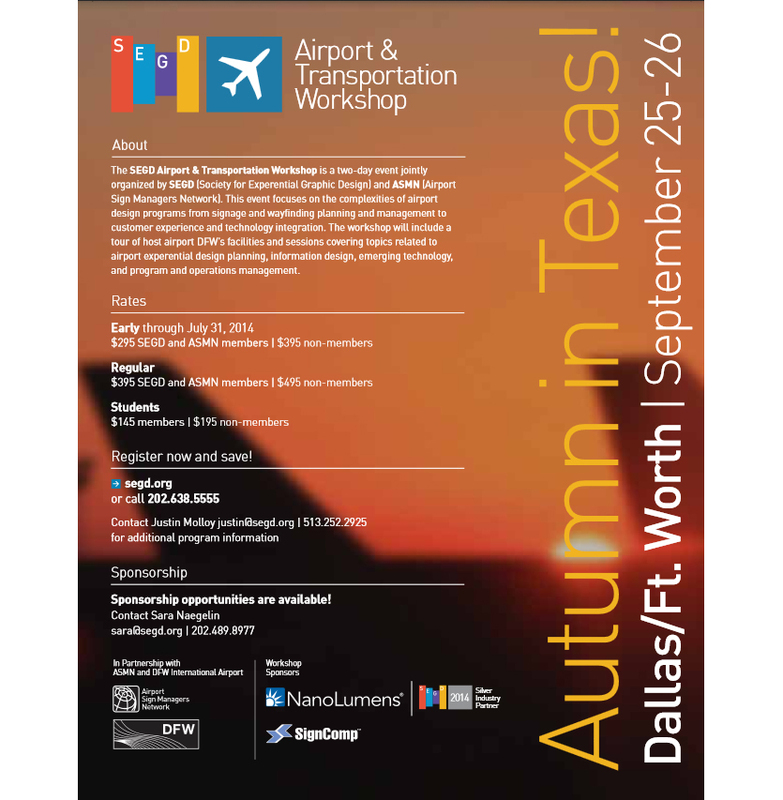 The workshop will include a tour of DFW’s facilities and sessions covering topics related to airport planning, information and experience design, and management and operations. This introduction to DFW International Airport will get attendees grounded in the big picture context of the airport’s development, history, the state of current airport master plan and signage projects, and how DFW is connected to the Dallas/Ft. Worth Metroplex. Navigating and developing a holistic communication and experience platform that encompasses many scenarios while maintaining a consistent look and feel within airport environments requires a vision and understanding of how complex systems will work together and how users will engage these various channels and touchpoints. This session will look at a series of case studies at DFW where design innovation was applied to various scales of the traveler’s experience from architecturally integrated signage, branded security checkpoints, and interactive customer information points. Having the capability to provide real time information and services to users continues to be a priority for transportation facility owners. Learn about the successes and challenges from a recent pilot study at San Francisco International Airport from the owner, designer, and technology integration team. From working with DOT Guidelines to integrating airport branding and technology. In this session you will learn from the experts what it takes to successfully implement effective roadway signage programs while aligning to codes, stakeholder expectations, and master planning programs. The most-anticipated segment of this annual SEGD/ASMN workshop is the host airport tour. Bring your walking shoes, cameras, and join us for a comprehensive afternoon tour of the DFW Airport. Our tour will feature the full airport experience including the airport roadway system, signage, inter-terminal transportation system, and passenger experience from landside to airside. You’ll have a chance to see the latest signage and wayfinding, fabrication, and digital installations integrated into the holistic traveler experience with insights from those who planned, designed, and built it! Friday sessions will focus on new airport projects both from a regional and international perspective and how they reflect brand, information technology, and architectural integration. If you choose to stay over Friday night, go local and get a taste of what the real Ft. Worth has to offer. From art museums such as the Kimball and the Ft. Worth Modern to the Stockyards and genuine honky-tonk country and western attractions—join our airport hosts for the real Texas experience! Transportation to and from Ft. Worth activities is on your own. We have reserved a block of rooms at a rate of $139 plus tax, US dollars. This rate is in effect through September 10, 2014; after that date, unsold rooms will be released. Make your hotel reservation using the code “SEGD” by calling 888-421-1442 or go to the Hyatt Regency DFW website to book online. Contact Sara Naegelin, Director of Sponsorship, at [email protected]; 202-489-8977. Or Kathleen Turner, Director of New Business, at [email protected]; 202-638-5555. SEGD thanks our sponsors for their support of the Education programs!